Terms updated March 12, 2019. All Again Again cups and black lids remain the property of Again Again Limited at all times. Cups and lids are loaned to End Users by the issuing cafe on behalf of Again Again, and on payment of a usage fee. Payment of a usage fee does not indicate a sale of the cup/lid. By using an Again Again cup or lid the End User agrees to return it to the network within two weeks. At that point, a full refund of your usage fee will be given, processed by the receiving cafe on behalf of Again Again. A refund will be available as cash and may be available as a digital transaction, if the partner cafe chooses to offer this. Lids will not be loaned on their own. 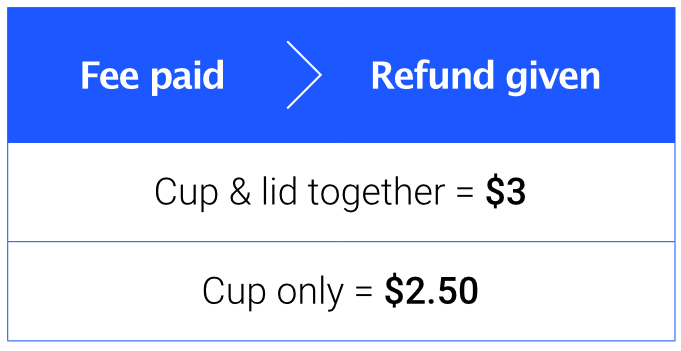 If black lids are returned separately, we will refund only $0.20c. We recommend that you keep them together. Coloured lids are for sale only. These are personal - some people choose to carry and use their own so as not to share the lid. Refunds for coloured lids will not be given. Participating vendors may choose to reject returned cups and lids that are mouldy. Please rinse first. Participating vendors may choose to reject returns of over 12 (each), cups or lids. For bulk returns, please contact Again Again Limited directly at hello@againagain.co. Cups and lids are washed and sterilised by the partner cafe in accordance with New Zealand Food Hygiene Regulations 1974. Paper heat sleeves must be used as drinks can be very hot. These paper sleeves can be used many times so please bring them back where you can. When they get tatty, they are fully recyclable. Please ensure that these are included in the paper recycling collection at home or work, or directed to home or commercial compost facilities. Don’t throw them in a public or general waste bin. We encourage you not to take a lid if you do not need one. The silicone lids are not recyclable in New Zealand. Sadly the only options for lids are either single-use or plastics. We have chosen to provide a lid which we feel facilitates the highest capacity for reuse. We continue to search for a better solution. In the event that the cup/lids are not returned within two weeks, Again Again Limited may exercise discretion on accepting the cups/lids. Reasonable maximum cup/lid usage is deemed to be 10 cups per week, unless evidence of greater end user use can be shown.